DR. ROY GRAYSON POST passed away peacefully July 23, 2007 in Tucson, AZ after a hard fought battle with cancer. Born in Asherton, Texas in 1923 and raised in Edinburg, Texas, he was the fourth of five children born to Ruth Grisham Post and Albert Kendall Post. HE MARRIED KATE JORDAN (BECKY) IN 1946. He received a B.S. in Chemical Engineering in 1944, and a Ph.D. in Chemistry in 1952 from the University of Texas. In the interim of these degrees, he served during WWII as a member of the Manhattan Project in Chicago. 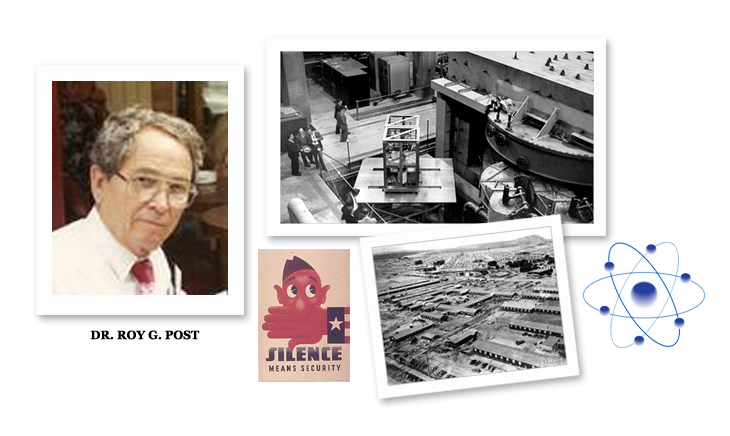 Dr. Post dedicated his professional life to applied research and later to teaching in the field of nuclear engineering and nuclear waste management. He was an engineer at General Electric Co. in Richland, Washington starting in 1952 and in 1956, moved to Texas Instruments in Richardson, Texas. IN 1961 HE JOINED THE FACULTY of the University of Arizona as Professor of Nuclear Engineering, where he continued until becoming professor emeritus in 1988. He authored over 100 publications in the field of nuclear engineering, as well as edited books on nuclear fuel reprocessing and radioactive waste management. He served as editor of the journal Nuclear Technology from 1969 until 1988. He was founding chief executive of the Waste Management Symposia, Inc., sponsor of the annual international Waste Management Conference.